Trusted customer data is the key to great customer experiences. It’s the only way to deliver personal service at scale. But managing a large number of customers means dealing with ever-changing customer data―and frequently updated addresses. 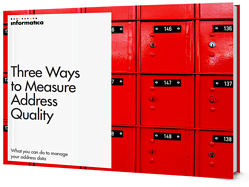 The good news is, there are three intelligent ways to measure the accuracy of your address data. How address data impacts your customer experience. How to check if your address data is up-to-date and actionable. What high quality address data looks like. When you have actionable address data, you can trust you’re delivering a brand-building customer experience―every time. Please complete the form on this page to receive Three Ways to Measure Address Quality eBook today.